I meant to post this in January, in commemoration of the New Year, which is when Japanese eat mochi as a celebration food. 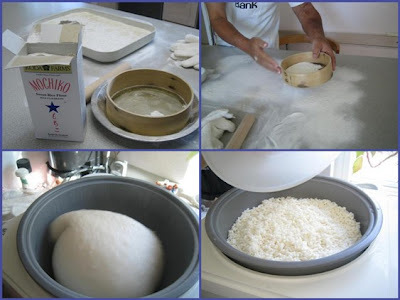 But since the sticky rice cake has become more familiar in American culture thanks to the popularity of mochi ice cream, I figured it's still worth posting belatedly, to explain what mochi is and how it's made. First, a crucial clarification: mochi ice cream is NOT mochi. Those bon-bon-like ice cream balls actually only have a very thin skin of rice cake around the ice cream. So please don't call mochi ice cream "mochi." Just like you wouldn't call chocolate-covered bon-bons "chocolate." They're bon-bons, covered in chocolate, right? 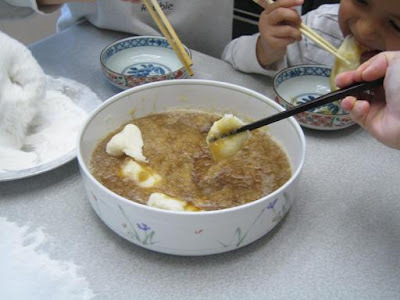 Mochi is actually eaten as a dense ball or patty (cake) of glutinous rice, used like dumplings in soup, or toasted to a crisp on the outside, gooey on the inside, and eaten wrapped in nori seaweed - much like the onigiri rice balls Japanese schoolchildren often have for lunch. And mochi rice cake is a key food item during New Year's. 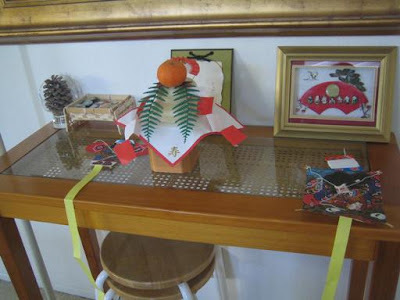 The Japanese commemorate New Year's Day on Jan. 1, same as Western cultures (as compared to the lunar calendar). But they celebrate the New Year not by getting crazy drunk and kissing everyone in sight (well, perhaps some lushes do), but by eating all sorts of special foods that signify good luck in different ways (soba noodles for longevity, sweet black beans for a healthy and productive year, etc.). Sort of like making resolutions through the stomach. 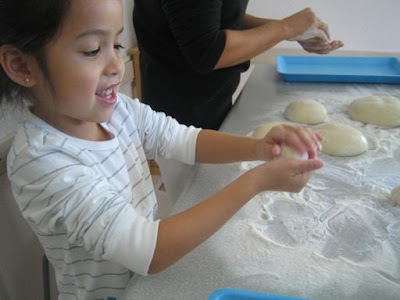 Traditionally, mochi is made in festive communal style, with friends and family gathering together to take turns pounding the rice (the men, mostly) into sticky mochi consistency with a wooden mallet in a stone or wooden mortar. The women and children, typically, then pull pieces of the sticky glob and shape them into smaller cakes for consumption. Laborious, but an anticipated holiday ritual. 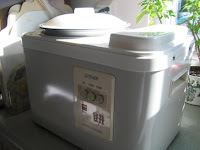 In this modern age, there are now mochi-making machines, similar to bread-making machines, that take care of most of the work, pounding the rice into the sticky mass. Everyone in my family loves mochi so much that my parents bought one of these machines years back, when they first came on the market. And every year, a few days after Christmas, my parents call us over for a day of mochi making - well, shaping, really. 2. 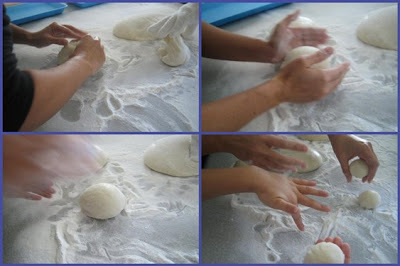 Shaping the mochi: My sister, Emi, is the most skilled at shaping the rice cakes. The mochi hardens quickly, so you have to work fast after it comes out of the machine. First, you pull a piece from the large mass and pull the softer inside part out to create the smooth surface of the cake/ball - sort of like flipping your clothes inside out. Then you pinch the the bottom of the cake to keep the round shape and smooth the surface all around. 3. And finally, the BEST part of mochi making: eating the fresh mochi with grated daikon radish. After all the work is done, we save the last batch of the day for eating fresh out of the machine. We pull the pieces off the mass and drop like dumplings into a bowl of the grated daikon, flavored with soy sauce. This dish can only be eaten with soft, fresh mochi - it doesn't work any other way because the mochi gets too hard to soak up the daikon bath. It's tangy, chewy, comforting. A true reward for the labor. *UPDATE/P.S. I mistakenly forgot earlier to mention a very important aspect of eating mochi: take small bites. 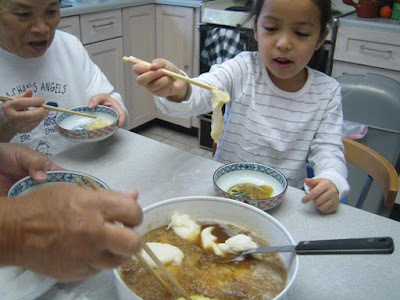 Every year around New Year's Day in Japan, senior citizens and children are reminded to consume the mochi in tiny bites so as not to choke on it. And every year after Jan. 1, there are news accounts of how many mochi deaths occurred during the holiday. No joke. Go forth and nibble and chew thoroughly!